School Lunches. Easily one of the most dreaded tasks parents have as school starts up again. There is something laissez faire and lovely about the laid back summer lunch routine. Grazing through the day without a routine that is set. Hungry? Grab something from the fridge. Then suddenly – BAM! – we’re thrown back into planning out lunch box sized portions over and over again. In fact, as parents, you’ll make 197 school lunches this school year! 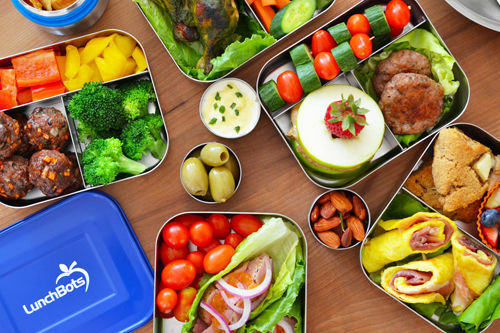 Here are some tips to keep those lunches less stressful and yet healthy for your kids! 1. Engage the kids. If they’re in grade 3 and above, they can make their own lunch! There may be some supervision needed but they can easily throw together a lunch. And even if your kids are younger or you choose to still make lunches then at the very least ask what they want. It’s amazing the success rate of vegetables and proteins being eaten if you ask them ahead of time what they want. 2. Offer variety. Stock your fridge with lots of choices of meats, vegetables, fruits, and more. Have your pantry full of healthy snack options. Keep batches of frozen muffins or cookies (homemade, if you can swing it!) in your freezer to be taken out a week’s worth at a time. 3. Make lunch fun. It doesn’t have to be Pinterest-worthy but adding a little excitement to lunches goes a long way. Some of our favourites are taking a toothpick to a banana skin to write a note, cutting vegetables into fun shapes, a cut apple slathered with Sunbutter (school-lunch friendly!) and dotted in the shape of a face with raisins, adding a note in their lunch box, etc. 4. Dips. For the love of dips! I used to think all kids liked something fun to dip their food in until my oldest daughter came along. But the other two think it’s fun and it’s an easy way to get kids to eat their veggies! Guacamole, ranch dressing (healthy homemade option HERE), Sunbutter, etc. 5. Have a baking day and stock your freezer with a ton of different types of muffins. These are a hit with my kids and we make a ton – blueberry, carrot, cranberry, raspberry, zucchini, banana, etc. Such an easy add to any school lunch! Hopefully this is a good start. One of the big challenges a lot of parents have is of course, vegetables. Even the Ryan kids tend to ask for carrots more often than any other option. 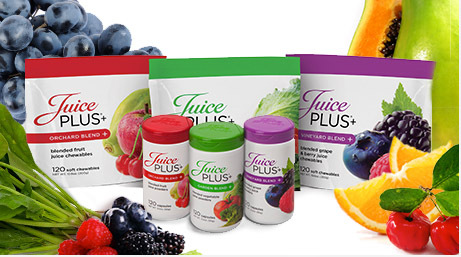 One way we’ve increased the vegetable content into our kids lunches is by using JuicePlus. Is it the best option? No, plain old veggies are. But for kids who are picky with vegetables, it’s a good back up for us. With 30 different fruits and vegetables packed into capsules or gummies, it’s a great way to keep both you and your kids getting more veggies and their nutrients into your diets! Questions? Check out the Children’s Health Study and then ask Dr. Andrea for more info!